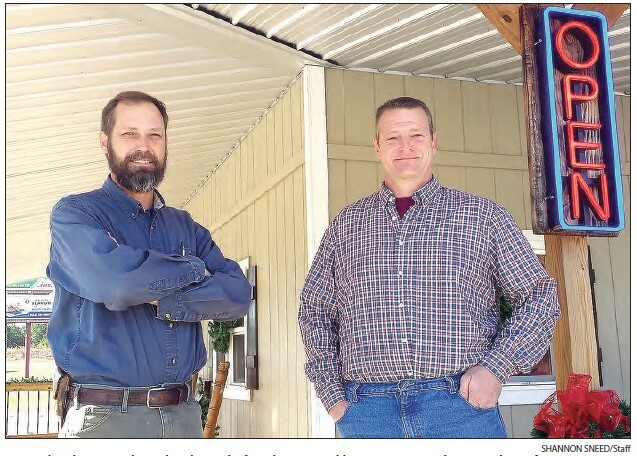 Matt and Keith Housworth stand on the porch of Southeastern Building’s Eatonton retail center and manufacturer. Southeastern Buildings celebrated 25 years in business last month. Owned and operated by the Housworth family, the first building was produced in November 1993. Since then it has produced more than 40,000 buildings and has sold more than 20,000 carports. “Back then they were called silver bullets,” said Matt Housworth, who is co-owner with his brother Keith Housworth. John and Marlene Housworth first started Southeastern Buildings in Loganville with their youngest son Keith working for them, He was 16 years old at the time. Matt later joined the family business at 19 years old. Matt, who lives in Putnam County, and Keith, who lives in Baldwin County, are both married with two children. “My dad and I drove to Eatonton to look at an old pallet manufacturing plant,” Matt said, noting he and his father argued that the location was too big for what they envisioned for the future. It turned out that it was not big enough and since then, they have expanded the facility. When the company opened, customers had only two building options. Now, Southeastern Buildings has approximately 14 different models. Noting that rural Georgia business has been good to them, the company has retail outlets in Jones County, Conyers, Loganville and other locations. 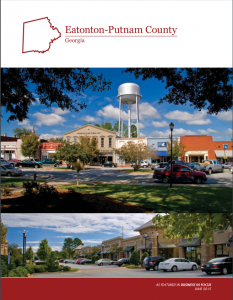 Eatonton is the only manufacturing site and, at that location, retail options are also provided. Twenty-five years later, they have 35 locations in four different states with their biggest market near North Carolina. “We can see growth all around,” Keith said, noting Southeastern Buildings, like many manufacturing companies, felt the sting of an economic downfall in the U.S in recent years. “Southeastern Buildings was hurting pretty bad,” Keith said. A turnaround in the economy enabled the Housworths to re-staff, going from 13 to 47 employees since the spring of 2017. The Housworths noted that when the economy went downhill, it was easier to tighten their belts and keep spending under control than it has been keeping up with the sudden growth. “The plan is to keep everything together that we are currently doing, continue to grow proportionately, and in the right direction,” Keith said. Buildings may be purchased on site from a large in-stock inventory or customers can choose their own design and have one custom built. The company also builds custom carports with the option of roll-up doors. Customers choose the number of windows they want in the building, and they choose the height of the roof. Southeastern Buildings delivers to its customers. They also supply all blocks and wedges as well as professionally install the product.